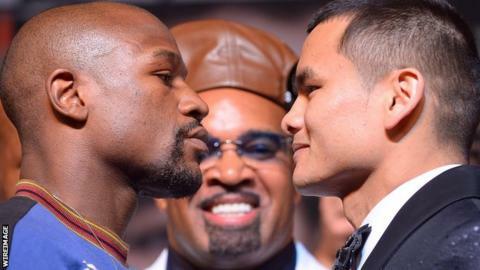 Unbeaten American Floyd Mayweather says he needs his "A game" to beat Argentina's Marcos Maidana on Saturday. Mayweather is 11-1 favourite for the WBC/WBA welterweight title unification bout at the MGM Grand in Las Vegas. "Everybody thinks he's just going to be a pushover, but I don't think so," Mayweather, 37, said. Floyd Mayweather represents a contradiction commonplace among fighters throughout the ages. The chaos and confusion in his life outside the ring is replaced by grace and control inside. His character belongs in boxing - and in Las Vegas. Figures released this week show a record number of visitors to this city in a single month (3.7million in March) and of all the attractions up and down the Strip, a Mayweather fight tops the rankings. His last outing, against Mexican Saul Alvarez, was the highest-grossing fight of all time, generating revenue believed to be in the region of $150m. Mayweather signed for a guarantee of $41.5m and his final take is estimated to be double that sum after pay-per-view sales, gate receipts and other incomes. The Alvarez fight was the second in a lucrative six-bout deal signed by Mayweather with a US cable network which could eventually boost his earnings by $250m. Marcos Maidana is the latest to attempt to crack what the five-weight world champion is now calling the May-Vinci Code. "You get your biggest purse when you fight me," he boasts. "If he brings his best, maybe he will be the first guy that actually makes me dig in my bag of tricks and pull out my 'A' game. "My whole career all I had to use was a 'D' and 'C' game to beat every guy." Mayweather, who has 26 knockouts from 45 bouts across five divisions, is widely regarded as one of the best defensive fighters of all time. Maidana, who won his most recent bout in December with a unanimous decision against the heavily-favoured American Adrien Broner to claim the WBA welterweight title, is known for his all-round skill and power. But Mayweather added: "I may be the hardest puncher he ever fought. He hasn't been hit by me yet, so we'll just have to see if he's the hardest puncher." Mayweather, who outboxed Saul Canelo Alvarez in his most recent bout in September to take the Mexican's WBA and WBC super welterweight titles, has repeatedly spoken about the need for patience against Maidana. "Maidana is hungry, he's ready and he has a great knockout ratio," he said. "It's all about keeping composure and sticking to the game plan. "We're going to take our time, go out there and if a guy leaves an opening on his face, we're going to take it, if he leaves an opening on his body we're going to take it." Maidana, 30, has an impressive professional record of 31 knockouts from 35 wins and just three defeats, but readily concedes he is the underdog. "I know people think I'm going to lose, but I come to win and I'm not afraid of anybody or anything," he said.